It’s not very often that you stumble upon the cost of dental implants being free in California. Almost all company benefit programs or Insurance plans will not cover such things as free dental implants since the procedures are classed as cosmetic surgery. Most dental plans will see this type of surgery a luxury or a secondary dental procedure in comparison to the very much need dental procedures of restoring existing teeth which is the case for most people. There may be an off chance that an offer for free dental implants arises. Should you decide to look into this offer make sure you review the qualifications of the dentist performing the procedure and that there are no additional costly fees that you may endure. 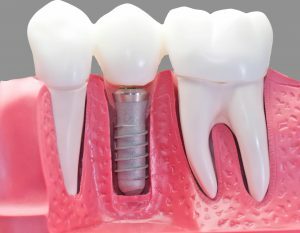 These days the cost of dental implants can be prohibitive due to the great expense of the equipment and materials that must be used to complete the procedure. There is also the duration that such surgery will take and plays a large part of dentists charging anywhere from $1200 – $5000 per implant. Many of these dentists that can implement this procedure are specially qualified, and not all dentists have this skill and specialty training. Although as mentioned above most insurance companies will not include dental implants into their policies, but seeking this out would not hurt, as some may offer it or at least a portion of it. Also, some company benefit plans may be willing to subsidize a part of the procedure. Research the dental Offices in your area to see if they might have a free dental implant service. If there is such an existing program, you may have to qualify for the procedure. Another way that you may find free dental implants is to search your State Dental Society and see what qualifications are needed to be eligible for charitable dental care. Here, if a program is in service and you qualify, they will refer a qualified dentist to you who will complete the free surgery or the cost of dental implants being invoiced at a meager rate. There are times when local colleges that have Dental programs within their curriculum and are seeking out volunteers for training the students with hands-on experience in such procedures as dental implants. Although these students are in training, they will always be accompanied by licensed and qualified dental surgeons during any of these training procedures. Usually, the whole cost of dental implants is covered by the college or university. As it may be a bit of a challenge to find a dental service that will offer free dental implants, when reviewing the reasons for your search, it is very much worth the work. Replacing dentures or even your natural teeth that are too far gone to be restored, with new dental implants will take care of many of the problems for life, and a bonus if you can find a free service. It is practically impossible to tell the difference between natural teeth and new dental implants. Once the Implants begin to integrate with your existing bone, they will continue to prevent any loss of bone and are now permanent. Your new implants will be as natural as real teeth, never affecting your speech or eating like dentures usually do. The bottom line is that if your teeth need to be replaced, the best and healthiest option is to have dental implants, and when the cost of dental implants can free, its all the more worthwhile to seek out the services reviewed. The cost of dental implants can vary on many different levels and aspects. Factors such as types of implants, jaw bone density or volume, amount of work or implants being completed, and the professional who will be finishing the job can make a tremendous difference in the final cost of the procedure. Other things such as consultation which sometimes can be covered by insurance, and of course your tax breaks or rebates on medical, optical and pharmaceutical purchases over $1250 in the USA can help to alleviate the cost. It also pays to shop around for practitioners that are offering discounts or specials as well as multi implant packages. Dental implants can come in various makes and brand levels — all composed of typically commercial titanium. The makes of implants can be classed into the inexpensive and the branded makes. The most popular makes of implants usually have an equal rate of success. Most Dental surgeons remain faithful to a particular brand because of the ease to work with, previous experience with the brand and the support offered by the supplier, etc. Even though the branded makes are the most expensive, they have the same success rate as any other make but can still increase the cost of dental implants. Sometimes there will be the insufficient bone volume to accommodate the implant requiring the need for surgery to increase this bone volume. Procedures such as a sinus graft or repositioning of the nerve can increase the cost by quite a bit. A qualified specialist will most likely perform this type of specialized surgery. Usually, the conventional abutment is used with the implant procedure, but sometimes a custom abutment may be needed. These abutments may be customized to suit a certain angle in which case a pre-angled abutment is used, as well as some being zirconium or even aesthetic. All of which are much more expensive than your conventional type abutment. There are also a couple of last added costs that need be mentioned. The final crown is fitted may be a made from porcelain or a procera, in which case the procera is more costly. The patient must also consider the possibility of any corrective surgery in the future that will also increase the cost of dental implants.